The EB specimen collection process is not physically or psychologically invasive for the donor. EB is a less intrusive and less embarrassing procedure when compared to directly observed urine specimen collection, as well as being a quicker, easier, more hygienic and more convenient collection process for those involved. There is no requirement for a donor to adjust clothing, partially undress, remove bulky clothing or wash their hands. Sample provision is simple; the donor has only to breath through a thin filter. Unlike other matrices, none of the donor’s DNA information is present in the resulting EB specimen used for analysis in the lab. Both the provision and preparation of an EB sample is more hygienic and easier for the collector to administer and monitor. It is very difficult for a donor to tamper with, adulterate or switch the sample whilst under constant observation by the collector. There is no requirement for the gender of the collector to be matched with the donor. In certain situations it might be possible for a collector to monitor the sampling of multiple (and mixed gender) donors simultaneously. Also, collectors do not have to wait for a donor to be able to provide an EB sample. Unlike urine samples, a breath sample is always available and plentiful. Sample preparation and transportation are simplified and postage costs reduced (small size and low weight) compared to the handling of a liquid (urine) in a suitable container. No piece part involved in the collection process is ever re-used, which reduces the risk of cross-contamination. 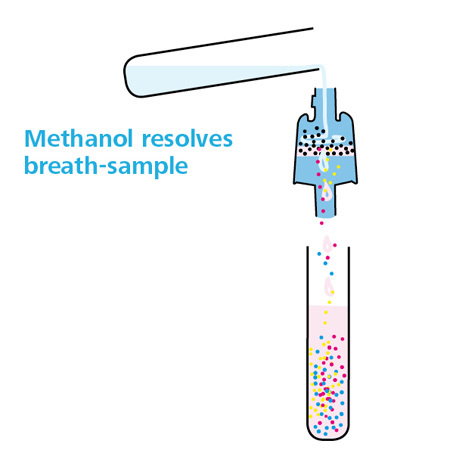 Once the initial step of specimen extraction (filter wash) and analyte preparation is completed in the lab, the remainder of the EB analysis process is similar to that already established for other sample matrices and uses the existing installed base of analytical instrumentation in testing labs. Since the detection window of EB closely mimics that of blood, the EB sample better represents the substances in the donor’s blood at the actual time of collection, giving a more precise indication of when possible enhancement/impairment occurs. EB allows for the detection of original intact drugs present in blood, rather than, as in the case of urine testing, the detection of their urinary phase I or phase II metabolites. An EB sample is a relatively clean matrix compared to urine. This may make analysis quicker and easier, which can reduce lab costs. EB offers considerable benefit in terms of cost saving and convenience for testing authorities since EB is quick and easy to use, whilst not requiring the provision of support resources such as privacy/toilet/wash/screening facilities or approved liquid refreshments. This can allow for more rapid and frequent testing as well as testing of a larger number of donors. For example, in the case of doping control in sports, more frequent testing of more athletes, may serve to increase the deterrence value of anti-doping programs, with minimum inconvenience to an athlete’s schedule. These practical considerations, together with the non-intrusive nature of the EB sampling process, means that it is strongly preferred by donors. 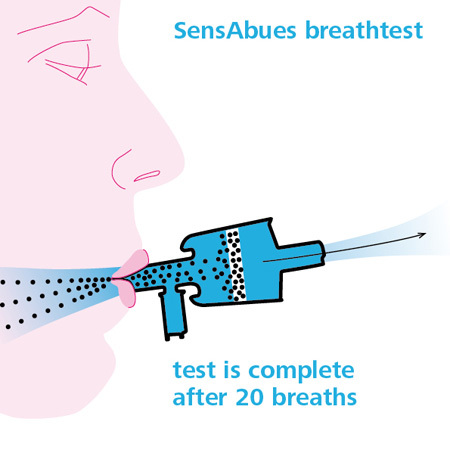 Detection Times for exhaled breath closely mimic those for blood. This good correlation provides a better indication of impairment, or in the case of sport, enhancement. EB test results are based on existing lab analysis techniques, which are court admissible and legally defensible. Also, unlike some other sample matrices, the resulting EB specimen used for analysis in the lab, contains no DNA from the donor, which may serve to avoid potential privacy law issues. EB samples can be stored for long periods before testing. During urine specimen collection, there is a need to carry out certain screening tests and prepare the specimen (pour the liquid into two glass specimen containers). As an example; to measure temperature using a thermometer or test strip, to measure the concentration (specific gravity) using a handheld refractometer, to measure the pH using instant read-out strips. Such types of measurements may be required to verify each urine sample is genuine and ready to be sent to the lab. However, in the case of EB, the same sampling device used to collect the specimen from the donor, is also used to transport the specimen to the lab. The specimen is enclosed within the device at all times. The device’s housing is not opened by the donor or collector so they never come into contact with the specimen held within the filter. The collector is not required to process the specimen in any way, except to seal the unit and prepare it for packaging and transport to the testing lab for analysis, using the appropriate chain-of-custody protocol. Since EB sample collectors are not required to do any sample preparation, measurements or screening tests to verify that an EB specimen is genuine, suitable, sufficient or adequate, this serves to reduce overall collection costs, collection time, support resources and skills training, whilst reducing possible sources of contamination. Also, reducing procedural complexity can reduce the likelihood administrative errors and so decrease the risk of invalidating the legally defensible test result.